This White Wine and Fresh Herbs Marinade is a great way to give tonights dinner a classy flavor upgrade! I don’t know if it’s my French culinary background or not, but there are certain flavors that always taste good together. 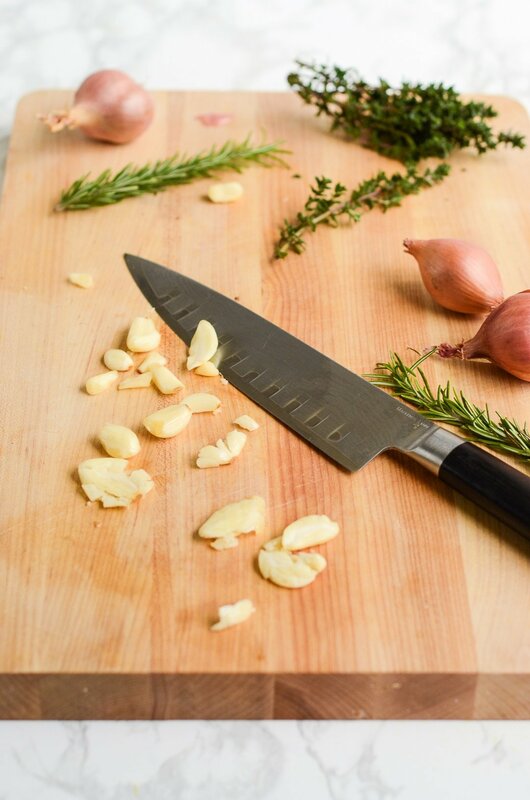 Today’s marinade is made of just those; white wine, garlic, shallots, and fresh herbs. One of the great things about this marinade is also that it works for pretty much anything from chicken, to beef, to fish, to pork. 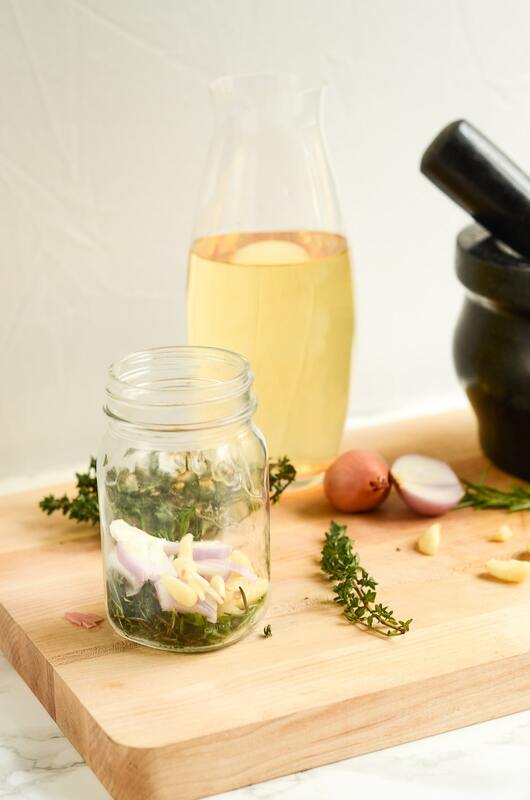 Master this White Wine and Herbs Marinade by rocking these culinary skills & techniques. How To Marinate. Get the most out of your marinade by learning how to effectively flavor and tenderize what you’re cooking. How To Buy & Store Fresh Herbs. Fresh herbs can be pricy. Find out how to the get the freshest ones and how to keep them fresh once they’re home. I hate when I buy a bottle of wine for a recipe and only ever use a cup or so of it. 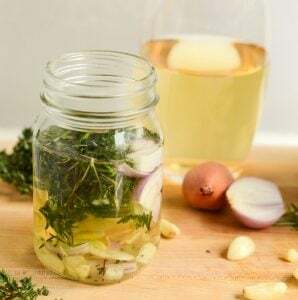 This White Wine and Fresh Herbs Marinade is a similar recipe, BUT it is great for using up one of those bottles when you make a different recipe. The downside to this marinade is that it has a limited shelf-life because of the wine. For the best flavor in this White Wine and Fresh Herbs Marinade, I recommend using a mortar and pestle to lightly bruise your garlic, shallots, and herbs. This will help release their flavor better and give a more prominent flavor in a short period of time. If you don’t have a mortar and pestle, the back of a spoon in a bowl will work well enough. 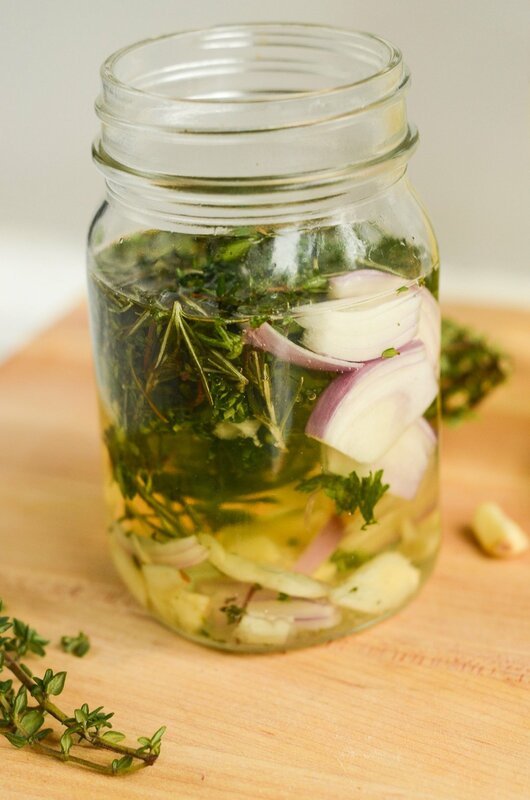 Get your free printable grocery list for this White Wine and Fresh Herbs Marinade HERE. This grocery list has everything that you’ll need to make this White Wine and Fresh Herbs Marinade recipe. To help in making grocery shopping simple, each ingredient is listed in easy-to-find grocery store amounts. If there is no amount specified, that means that you can buy the smallest (or largest) container available and still have plenty left over. Give your dinner a classy flavor upgrade with this marinade made of leftover ingredients. 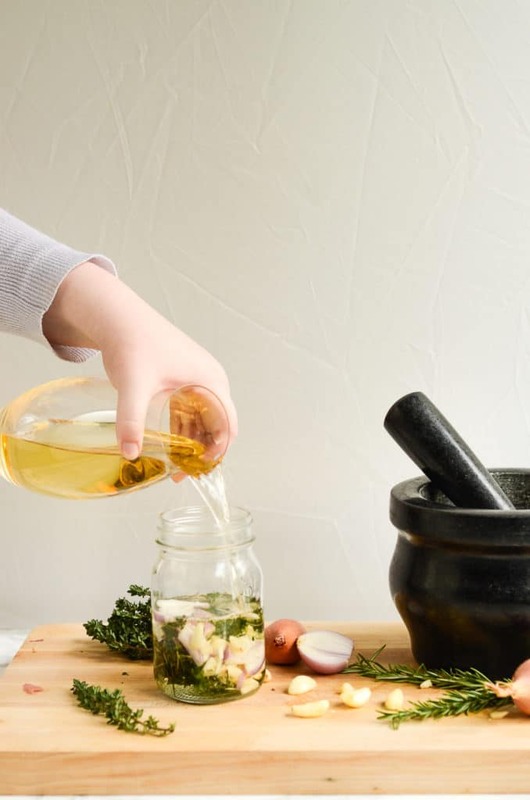 Using a mortar and pestle, lightly bruise the herbs, garlic, and shallots until the mixture is slightly wet and the herbs are a little wilted. Using the smallest container that what you will be marinating will fit into, pour the marinade over until the product is completely submerged. Let marinate for up to 8 hours. Don't have a shallot on hand? Use 1/4 of an onion instead. What a great post! I always forget about marinades – I just never remember to use them until I am ready to cook!